Whether you are following the Mediterranean Diet plan or looking for healthy Mediterranean Diet recipes, appetizers are great to serve before a main course or enjoy as a light lunch or snack. Each mouthwatering appetizer is filled with healthy, delicious and nutritious foods. Tzatziki is a very versatile dish. Often served as an appetizer as a dip for fresh vegetables, Tzatziki is also served as a salad dressing, sauce or spread. Place the yogurt, cucumber, garlic, dill, olive oil, lemon juice, salt and pepper into a blender or food processor. Blend or process until well mixed. Place into a covered container. Refrigerate for at least one hour before serving as a dip with your favorite fresh vegetables. Brush the bottom of a baking dish with olive oil. Slice tomatoes into ½-inch thick slices. Place the tomatoes slices into the baking dish. Sprinkle the garlic and basil onto the tops of the tomatoes. Drizzle olive oil over the sliced tomatoes. Bake for approximately 20 - 25 minutes. Remove from baking dish and serve. Saute the onion, garlic and a diced red bell pepper in virgin olive oil until tender, and onions are translucent. Drain and rinse two cans of white navy beans. Serve with warm slices of whole wheat pita bread. 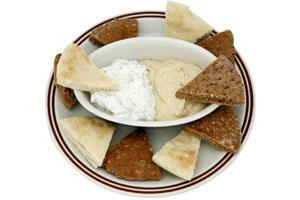 When it comes to Mediterranean Diet recipes, appetizers often double as dips, sauces and spreads. Many are also enjoyed as side dishes served as an accompaniment to a main course. Whether you are following the Mediterranean Diet plan as a way to lose weight, maintain your current weight or adopt a healthy way of eating, the health benefits are numerous. According to the American Heart Association, by eating healthy and nutritious foods such as those included in the Mediterranean Diet, your risks of having a stroke or heart attack are reduced. Remember to check with your doctor before beginning any type of diet to make sure it is safe for you.